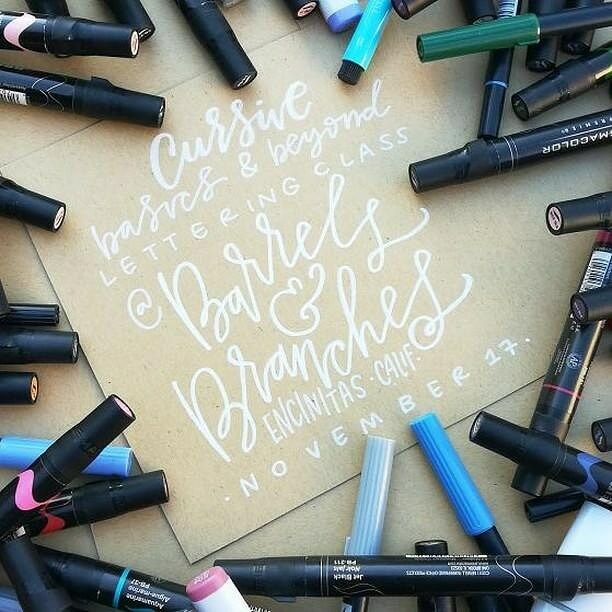 Come join Lauren of Laurenish Design for her Cursive Basics & Beyond Lettering Workshop here on Saturday, November 17! If your cursive could use a little modernization or you need to start from square one, this class covers just about everything. Lauren will go over several lowercase, uppercase letterforms, and flourishes. You’ll put them through several refining exercises so you can leave the class inspired with a new writing style. Writing supplies will be provided but if you have any favorite pens or a sketchbook you’d prefer to use, feel free to bring them along. This workshop will also include a make & take featuring a small glazed pot that Lauren will help you customize. $65 per person payable upon registration via PayPal. Please note that if you pause during registration and the PayPal system times you out, registration isn’t complete. Registration is only complete once PayPal sends you a payment confirmation email and our workshop system sends you a registration confirmation email. For any questions, please email events@barrelsandbranches.com. — Workshop fee is non-refundable 24 hours prior to workshop. If class minimum of 4 students isn’t met, workshop may be cancelled. If cancelled, fees will be reimbursed. Lauren Cotter, owner of @laurenishdesign, works out of her interior design studio in Redlands creating lettering & illustrations for clients as well as teaching workshops.